The lot now occupied by the Wells Fargo Building had a series of wooden structures on it from about 1851 onward. These structures were home of the American Hotel. William Daegener rented a portion of these structures as early as 1853 and used them as the Columbia office of the Wells Fargo Company. Another section of the Hotel housed the Stage Office of Kelty & Company. Fires burnt down these structures on a number of occasions. In 1856, Daegener purchased the building. After a fire once again destroyed the American Hotel in August of 1857, Daegener (not a real quick study) rebuilt of wood. Finally, in 1858, Daegener built two structures of brick. The Wells Fargo Office occupied the downstairs of the two story structure and Daegener and his family lived upstairs. A store occupied the other, single story structure (now the "Stage Coach Office") on Daegener's property. In 1861 the smelting room was added to the rear of the structures. 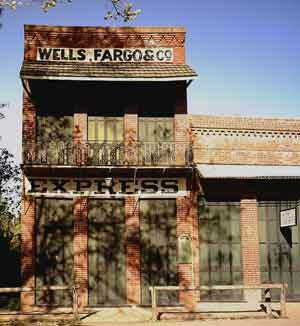 In 1872 Daegener sold the structures to H. Sevening, who became the Wells Fargo Agent. He in turn sold to a man named Conlin, who ran the Wells Fargo Office as well as a store and telegraph office. In 1914 Wells Fargo closed the Columbia office, but Conlin continued to run his other businesses out of the building. Wells Fargo gained possession of the building during this time. After Conlin died in the 1930's, Wells Fargo allowed his sisters to continue residing in the buildings. In 1946 the State of California purchased the structure from Wells Fargo as part of the creation of Columbia State Historic Park.